1. Approved by the CCS(China Classification Society),approved by ZY of China Fishery Inspection. 2. Passed the authentication of CE. 3. Approverd by Germanischer Lloyd "GL". 1. Marine naviagtion signal light applied to the ships with the length 50m or above 50m as lamp signal liaison when night navigation . 2. This naviagtion signal light shell is made of high-strength engineering plastic PA+GF,the lampshade adopts injection of PC,lens hood adopts good quality stainless steel. 3. 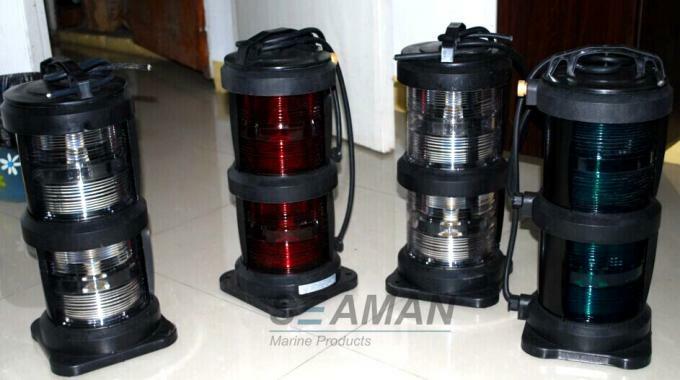 This navigation signal lights have the whole seal structure,it is waterproof under the bad environment. 4. Lamp holder and the base adopt plug-in type,can replace the up and down bulb as open the cover. 5. The signal light adopt the signal light's bulb which conform to the ship norm,and the average life is not lower than 700h. 6. The signal lights can work normally under the temperature -30oC to 50oC. 7. Conrorm to THE INTERNATIONAL REGULATIONGS FOR PREVENTINGS COLLISION AT SEA,1972 and GRADE ENTRY NORMS FOR STEEL SHIPS.